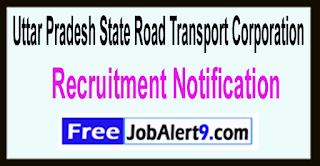 UPSRTC (Uttar Pradesh State Road Transport Corporation) Has Released Recruitment Notification For 748 Samvida Conductor Posts. All Eligible & Interested Candidates Can Apply Online. Further Detailed Information Regarding Educational Qualifications, Age Limit, Selection Procedure, Exam Pattern, Syllabus for UPSRTC (Uttar Pradesh State Road Transport Corporation) Recruitment 2017 - 748 Samvida Conductor Post is mentioned below. Age Limit - Candidates age should be between 18 to 40 -Years. How To Apply - All Eligible & Interested candidate fill the on-line application through official web-site (http://www.upsrtc.com). before (22nd May to 26th May 2017). Online Registration of Application Form Ends On - 22-05-2017 to 26-05-2017. Click Here For UPSRTC Recruitment 2017 Detailed Advertisement. UPSRTC (Uttar Pradesh State Road Transport Corporation) Has Released Recruitment Notification For 627 Samvida Conductor Posts. All Eligible And Interested Candidates Can Apply On-line. Further Detailed Information Regarding Educational Qualifications, Age Limit, Selection Procedure, Exam Pattern, Syllabus for UPSRTC (Uttar Pradesh State Road Transport Corporation) Recruitment 2017 - 627 Samvida Conductor Post is mentioned below. How To Apply - All Eligible & Interested candidate fill the on-line application through official web-site (http://www.upsrtc.com). before / (17th May to 23rd May 2017). Online Registration of Application Form Ends On : 17-05-2017 to 23-05-2017.